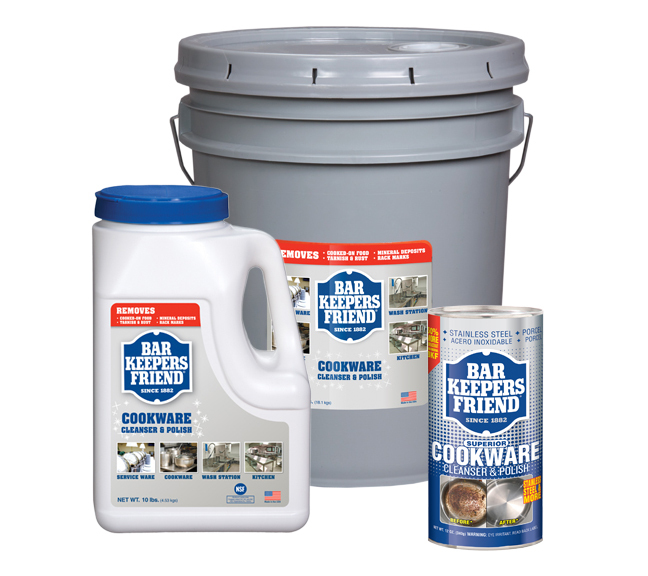 Clean and restore cookware (stainless steel, copper, ceramic, brass, and hard-anodized aluminum) and kitchen surfaces with biodegradable, NSF-registered BKF Cookware Cleanser. This V.O.C.-free, chlorine-free, bleach-free product easily cuts through oils and grease and eliminates cooked-on foods as it scours, brightens, and polishes. In addition to cookware, BKF Cookware Cleanser also extends the life of porcelain plates by removing knife marks, tarnish, and stubborn stains. Sprinkle on surface or a damp sponge or cloth. Gently rub the surface to activate the product. Make a paste of the product and water. Let paste sit on surface for not longer than one minute. Do not use on gold, silver, or lacquered surfaces. For brushed finishes, polish with the grain. From copper to porcelain to stainless steel, Bar Keepers Friend tackles the toughest cookware challenges.